Because Mr. Afremov was nice enough to accept my friend request on Facebook and also to invite me to stroll through his Virtual Exhibition and share my thoughts in the Critics discussion page of his newest November paintings, here I am, an amateur critic, more like a little elephant in a China shop, sharing the feelings I got by contemplating the painting below, titled “Old Vitebsk”. The shadows of the night engulf everything in a cool, velvet slumber and one poor soul is guided to find shelter under a tall and welcoming arched doorway by the warm, friendly light of a delicate wrought iron street lamp. Though the long strokes of the “night” colors suggest a strong wind and a wild storm, it’s striking to notice the peace and comfort so easily suggested by the milder strokes of the warm colors spread by the single light source – a street lamp which is a landmark for civilization. What intrigues me is the rather ambiguous silhouette in the bottom left corner. It may be a woman, heading towards shelter, but she stands straight, not bending to protect herself from wind and rain. Indeed it looks like she has covered her head with something, but there’s also an illusion that the silhouette may have angel wings…? This would transcend the painting into an even higher spiritualized symbolism. Or it may be that the rain has just stopped, that is why she doesn’t appear to be in a hurry. Her long dress and the street lamp make you feel like you’ve travelled back in time, though such images are still familiar in “old towns” all across Europe. Also, the silhouette is placed right at the intersection of shadow and light (albeit the reflection of both onto a wet pavement). 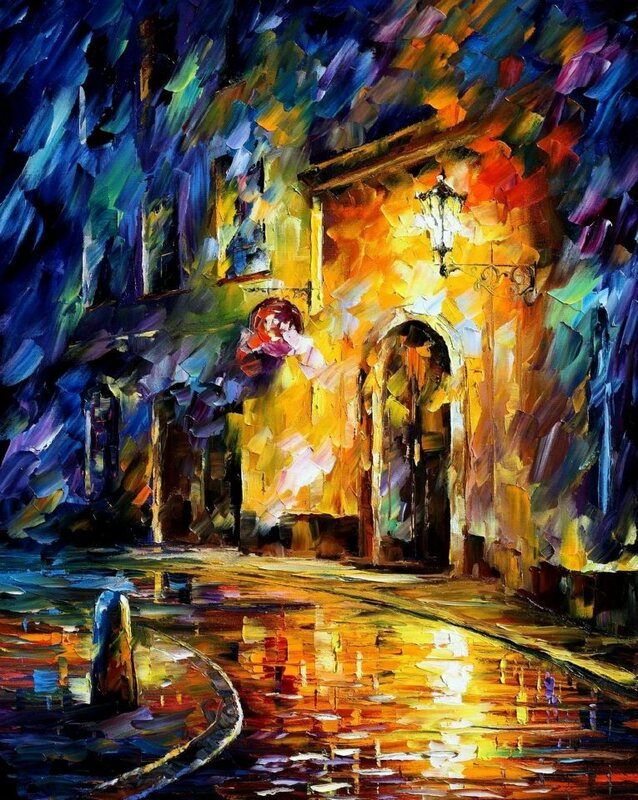 I always love how Mr. Leonid Afremov details the street lamps and other wrough iron structures, his amazingly vivid skies and most of all, his “invisible, happy rain”. All his paintings which have reflections of wet pavement/watery surfaces, even obvious clues like umbrellas, are never gloomy nor leave you a chilling feeling. For him, unlike for most people, rain is a cause for joy, not at all a discomfort. You forget all about muddy shoes, wet feet, damp clothes and other nasty things that usually come with a rainy day when you look at the “happy rain” paintings. Even if it’s autumn, it is always warm, vibrant and positive in Mr. Afremov’s thematic universe.